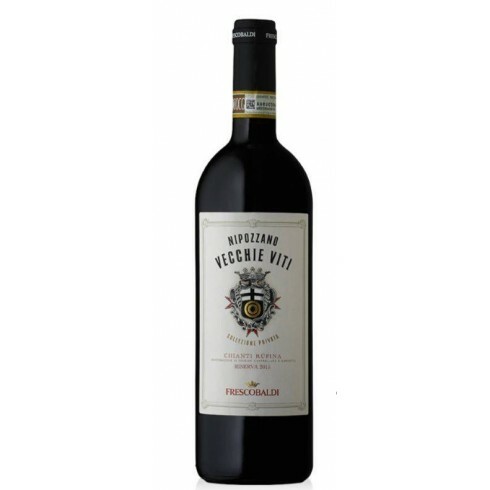 2014 Nipozzano Vecchie Viti from the famous Frescobaldi House in Toscana. A wine with a great potential, sourced from the oldest, and most deeply-rooted vines at the Castello Nipozzano, displaying a superb complexity and harmony. The Sangiovese and other vines for the Nipozzano Vecchie Viti Chianti Rufina Riserva red wine grow in the vineyards at Frescobaldi’s Castello Nipozzano winery near Firenze in Tuscany.The grapes were harvested by hand, sorted and destalked followed by 20 days fermentation on the skins. The wine was matured for 24 months in large oak barrels followed by 3 months in the bottles. Bouquet: Fine balance between the floral notes of apricot and the spiced notes of rose hip and vanilla. Taste: Fresh, complex and persistent. The tannins are built within the body of the wine, which is silky and harmonious. The acidic component is significant and blends in elegantly with the alcohol content.